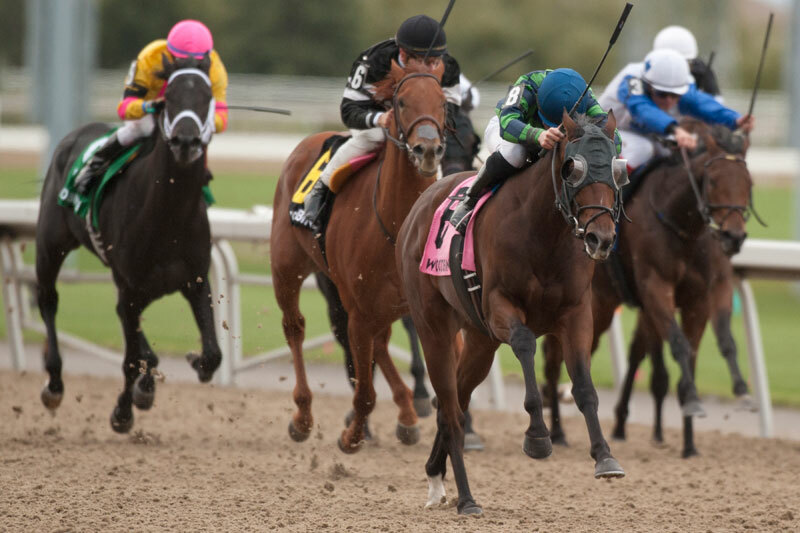 Two-year-old colt Solidify was the stakes star of Woodbine’s second annual Grey Day on Sunday, as he circled the Grey Stakes field to win the featured $125,000 Grade 3 event contested over 1-1/16 miles on the main track. The energetic European invader Chuck Willis fired out of the gate to establish the lead with Jammin Still and 4-5 favourite Nashtrick stalking three-wide through opening fractions of :24.33 and :48.40. Meanwhile, Solidify broke outwards from post eight but ducked inside and trailed the field early on. Once settled, Emma-Jayne Wilson moved Solidify into contention, progressing four-wide down the backstretch and improving position on the final turn as the field passed three-quarters in 1:12.33. Chuck Willis, Nashtrick and Solidify raced three-across turning for home with Solidify eventually surging ahead down the lane. Tripwire, who had a ground-saving trip behind the leaders, came through between horses and offered up a valiant effort fighting on for second-place honours. The Tapizar-Elaborate colt is now undefeated in two starts for trainer Reade Baker and Boston-based owners Paul Braverman and Timothy Pinch. Bred in Kentucky by China Horse Club International, Solidify is a full-brother to Peppered, who was the runner-up in last year’s Grey Stakes. Solidify prevailed in a final time 1:43.90 by half a length over Tripwire with Sir Winston finishing third, 3-1/2 lengths behind. Sent postward as the 4-1 second choice, Solidify paid $10.30, $5 and $4. He combined with Tripwire ($6.40, $4.40) for a $2 exacta, which returned $72.70, while the $2 trifecta, completed by Sir Winston ($6.70), paid $424.70. Grimgrinnin’ Ghost, the longest shot on the board at 42-1, edged out the other Baker trainee, Inclusive, for fourth, resulting in a $2,448.60 payout for a $1 ticket. Jammin Still, Nashtrick and Chuck Willis completed the order of finish.